People often think that maturity is something that you gain over the years, that by simply living long enough, you’ll end up a mature person. But it’s an achievement, one that not only takes time, of course, but effort and courage as well. 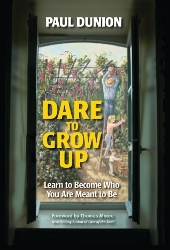 Dare to Grow Up offers a unique study into the psychology and culture surrounding maturity, from personal shortcomings that stunt growth to wider societal attitudes that limit the discovery of our true selves. If you are willing to open your mind to the mysteries of life and enrich your life with all that the world has to offer, you can begin to discover who you were meant to become.